Battle hardened unit and trooper “G.W. KNOLL/3 CO. K./N.Y. CAV/MILLERSBURGH PA”. Identification Discs book by Maier/Stahl rates this style disc as Extremely Rare; raised letters – “In the War of 1861, 2 & 3 & 4”; larger one of this spread eagle design - 30mm. 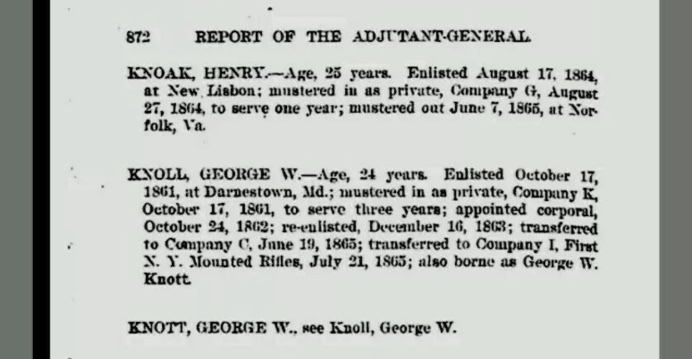 Knoll was at war for 3 3/4 years; see insert from official 3rd NY Cavalry roster. Large quarter plate. Interesting image of what appears to be a gray clad soldier armed with a musket (model 1842?) and a large brass handle side knife. Nice content and clarity; some spotting, contrast to a lesser degree. Worn case with spine repair. Large quarter plate. Good content, contrast and clarity. Worn case with spine repair. Hard to find a better dug example; glassy smooth patina. Hard to find earliest style of small US plate. The 1839 regulations prescribed small plate US plates. The unreliable iron wire belt hooks were replaced with bras arrow hooks in 1844. Untouched condition with very nice patina; eagle with clasped revolver on both sides; 3 steel screws around collar. Small dent on one side near collar. Large and early Maritime telescope marker marked “Spencer Browning & Rust, LONDON, DAY or NIGHT”. Issue with optics. Overall 36 inches and 2 ½ inches in diameter. Very nice ruby red 1/6 plate ambrotype in a nice leatherate case. Very clear, crisp image of a soldier armed with a bayoneted Enfield rifle with a white buff sling (you can clearly see the rings on the tip of the ram rod); large belted bowie knife; visible US belt plate; infantry horn insignia and letter/number (?) on kepi. Just a nice image – clarity, content and contrast. Some of the picture show a glare from flash. Clear tintype in very nice gold trimmed leatherate case. Image of soldier with bayoneted rifle at his side;4 letters numbers/letters (?) on top of kepi; and full leather accouterments. Nice image. 291 RARE “Rangers 1812” Button, Nondug. Boston Massachusetts Rangers coat button. Albert's MS80A, Tice MS122A1; 21mm. Very difficult to find, the last one I had was from the Owen’s collection sale about 35 years ago. Beautiful button; gilt remaining; rim ding at 7 o'clock. The Rangers formed during the Anglo / American War of 1812, and formally organized in 1820. Beautiful classic design/die work. 289 Antietam Battlefield Buckles – Dug with Provenance. Marked in white paint distinctively by the digger “ANTIETAM BATTLEFIELD BURNSIDE BRIDGE”. Other portions of buckles lost to time. Sharpsburg battlefield relics with solid provenance to the historical Burnside Bridge struggle. Dug in the 1950s/1960s; a group of relics marked like this buckle were available on the market in the 1980’s. See catalog pictures for reference purposes of similar marked relics from the sale of the collection; many of the items sold by a recognized dealer in relics which is the source of the catalog. 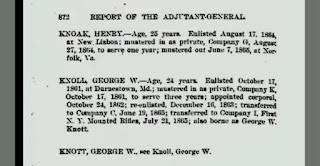 Years ago I a collector shared that these relics were dug by Bud Murray of Jefferson, Washington County, MD, same county as the Antietam Battlefield; I’m not sure of the Bud Murray connection and would appreciate any related information. 288 VMM Buckle, ca. 1855-1861, Nondug; Volunteer Militia of Maine. Desirable harder to find lead filled variety and nondug plate. Absolutely exceptional untouched even glassy patina; could not be better. Solid nondug condition with campaign wear slight face bends and edge bends; see photographs. Displays very nicely. 287 SNY Puppy Paw Buckle, ca. 1861, Nondug. SNY Puppy Paw Buckle, ca. 1861, Nondug. Solid war time plate that saw service.